Theater Solutions by Goldwood Symphony Series in-ceiling angled speaker is designed for consumers who demand the very best quality sound. The 15 degree angle is designed for directing the sound towards your listening area. This speaker is the perfect solution when in wall speakers are not an option. 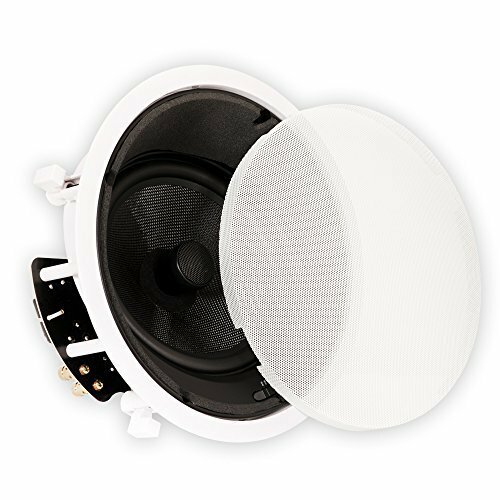 This speaker can be used as your front, rear or center channel. Deep bass, full bodied sound and comparable quality to the name brands, but at an affordable price. This speaker is perfect for home theaters, surround sound and all styles of music. Made with only the highest quality, moisture resistant materials to deliver unsurpassed sound in any listening environment. Sophisticated design and measurement equipment, including computer assisted design software were used to design this speaker to achieve an optimized balance and interface between components to give the very best quality performance and longer life. The easy in-ceiling installation and ultra wide sound dispersion design make them ideal for discreet, single or multi-room installations. All of Theater Solutions Speakers are self-mounting and feature the latest swing-out dog leg mounting system for easy installation. Paintable white aluminum grills that offer added rust protection in moisture-prone areas such as bathrooms, kitchens and saunas; as well as a fabric scrim inside the grill that hides the drivers from view and will not interfere with the sound. The interlaced glass fiber 8" cone with butyl rubber surround is extremely lightweight yet rigid for even more extended bass, smooth high frequency response and greater power handling. The 1 inch pivoting liquid cooled silk dome tweeter offers the smoothest high frequency response and pivots to direct sound at listeners. The three position tweeter switch allows for precise tuning to your rooms acoustics. A 2nd order 18dB per octave crossover round out the state of the art components that add up to the best quality and design at a fantastic price! !